“The overarching vision for our network is simply for the church to be the church,” say Bishop Bryan, “faithful in the ministry of Word and Sacrament, passionate in presenting Christ to our communities through creative means of evangelism, and extending compassion to the needs around us.” Learn more in this special interview now online! The Rt. Rev. David Bryan is the bishop of PEARUSA’s Southeast Network and rector of Christ Church, Murrells Inlet, SC. He was consecrated bishop by Archbishop Onesphore Rwaje and Archbishop Robert Duncan on September 18, 2013. Among those attending his consecration included bishops and clergy from PEARUSA and the Anglican Church of North America, as well as Bishop Mark Lawrence of the Diocese of South Carolina. Bishop Bryan is a graduate of the University of Florida (BSBA ‘79). He received his M. Div. from Trinity School for Ministry in 1983 and continues his work on his Doctor of Ministry degree at Trinity. He has been in ordained ministry for 28 years, serving five churches in Florida and South Carolina. He and his wife, Nancy, have three grown children and live in Murrells Inlet, SC. I grew up in a Christian family that was very involved in the life of the church and thankfully I was given opportunity (which doesn’t always happen) as a teenager to respond in faith to a clear presentation of the gospel where I was captivated by the love of God for me in the gift of his Son upon the cross. My growth as a disciple in those early years was difficult, but took a decided turn for the better in my college years when I encountered the life and power of the Holy Spirit in a new and deeper way. My family’s church was the Episcopal Church, so I didn’t have far to travel. How do you envision your role as a bishop in the Anglican Church? It is my hope, as bishop, to encourage and equip the clergy and congregations in becoming effective and fruitful in mission and ministry in their given contexts through the use of appropriate tools for assessment and coaching/mentoring for each of these congregations. Church planting, as well as leading existing congregations, can be a very lonely and isolating endeavor. Our pastors need a pastor/bishop who will listen, encourage and guide them in helpful ways. My commitment is to make regular visitations and to be accessible to these clergy, taking advantage of technology to maintain regular contact with clergy as well as lay leaders as needed. I also hope to promote a healthy sense of unity within our network as well as with our sister churches in the ACNA dioceses in our geographical footprint. This means that we need to be highly collaborative and commit to communicate clearly with one another. It also means that we need to be faithful in showing up and participating corporate gatherings that promote unity and foster mission (Network retreats, assemblies, Provincial gatherings, etc. ), as well a local, smaller cluster gatherings of our clergy and churches. How many churches are currently in your network? We have 18 churches spread throughout the Southeast United States. What are the priorities in your diocese/network? The overarching vision for our network is simply for the church to be the church, faithful in the ministry of Word and Sacrament, passionate in presenting Christ to our communities through creative means of evangelism, and extending compassion to the needs around us. All of this can only happen through the power of the Holy Spirit and for the glory of God who has purchased our salvation through His Son, our Lord Jesus Christ. We also have an opportunity to raise up and develop next generation leaders in our Network, particularly through our congregations’ relationships with seminaries (e.g. Beeson Divinity in Birmingham, AL; Columbia International University in Columbia, SC; Reformed Theological Seminary and Gordon Conwell in Charlotte, NC). We have existing internship programs and new opportunities to shape young leaders for mission and ministry, which are a high priority. How do you envision church planting in PEARUSA’s Southeast Network? Our churches are relatively new churches and missions who each have a vision for multiplication and partnership in additional churches plants. Our clergy are highly missional in perspective and our Network Leadership is committed to collaborate with them for the sake of the spread the Gospel and the establishment of new Anglican communities of faith. We have structured our finances in such a way that a large percentage of our income goes directly into church planting within our region under the leadership of our congregations and Network Council. What excites you most about your ministry? As the rector of a local congregation, Christ Church in Murrells Inlet, SC, I love leading a parish, preaching the Word and living life with fellow believers. We describe our purpose as “Connecting people to Jesus Christ, to one another and to God’s work in the world.” That mission never grows old! As a new bishop, I am excited to encourage clergy and congregations in the pursuit of their God given mission – each unique to their own context, but all centered on the glorious gospel of our Lord Jesus Christ. 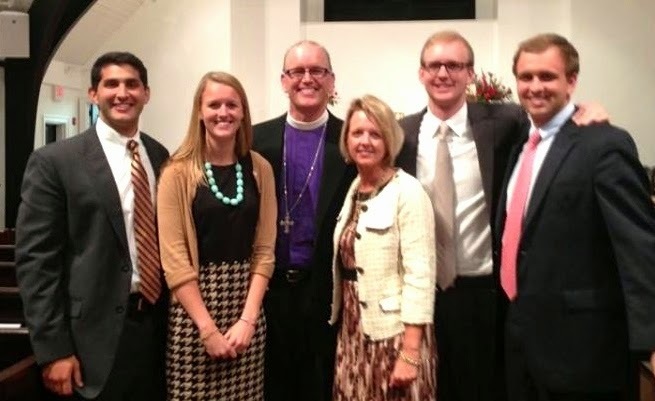 How do you balance your family life with your calling as a bishop? You probably need to ask my wife that question! Fortunately, our three children are grown and Nancy is fully engaged in my ministry as a bishop, so it seems to play out (at least so far) in a fairly balanced way. What is the name of a book you are reading right now? What do you like about it? The Explicit Gospel, by Matt Chandler. It is a straightforward and thoughtful explanation of the Good News that is ours in Christ. What do you see as a major challenge facing Christians today? How do you see Anglican Christians making a difference in that challenge? We live in generation where the Church (in the West particularly) has suffered greatly precisely because of the lack of defense of the orthodox Christian faith by the leadership of the Church. The Anglican way calls us to “guard the faith, unity, and discipline of the Church.” This requires a careful and intention stewardship of the “faith once delivered” found in the teachings of Holy Scripture and represented in the foundational Creeds of the Church. It is important for our bishops, presbyters and lay leaders to operate collegially and deliberately in refuting erroneous teachings as necessary in our particular cultural context. This requires a robust theological engagement and a commitment to the one holy catholic and apostolic faith as we have received them in Anglicanism. It is also necessary that biblical preaching and teaching undergird the life of our congregations. Ongoing nurture in the Word of God through both private and corporate disciplines of study and worship creates a path toward life transforming discipleship as well as a proactive safeguard against heretical teachings and practices. Along with the clear articulation and modeling (orthopraxy) of true and godly doctrine comes the necessary discipline within the life of the church. We have witnessed in the mainline churches of the last 40 years a failure to discipline new and errant theological innovations in doctrine – only to be followed by the ultimate embrace of those doctrines in subsequent years. The Church must be willing and committed to “speak the truth in love” and exercise godly governance through its leadership, maintaining our fidelity to the teachings of Holy Scripture and the Church throughout the ages. What has being a father taught you? I have a deep gratitude for the different way God has created each of our three children. For all they have in common, each of our children possess unique gifts and temperaments. At the end of the day, as a father, I simply love them for who they are and encourage them to continue to grow in the Lord as they have entered into adulthood. Being a father has given me a limited glimpse of our heavenly Father’s deep love for us as His children. What matters most is that we live in relationship to Him. A lot of the stuff that the world says is important in life dims in comparison to this! As a newly consecrated bishop, I would appreciate your prayers for a good beginning of my episcopacy. Particularly that I would be effective in encouraging our clergy and churches in their mission and that I would experience God’s grace in maintaining proper balance in local ministry, ministry in the network and a vital spiritual life with the Lord.